Great things coming up at the Concordia Greenhouse! Check out our Youtube Channel, featuring our latest video HERE! If you`ve ever enjoyed the greenhouse, or have wanted to volunteer to learn more, and help out NOW IS THE TIME! For the next week, we have a lot of fun and interesting volunteer tasks, so please come by during our opening hours for volunteering options! 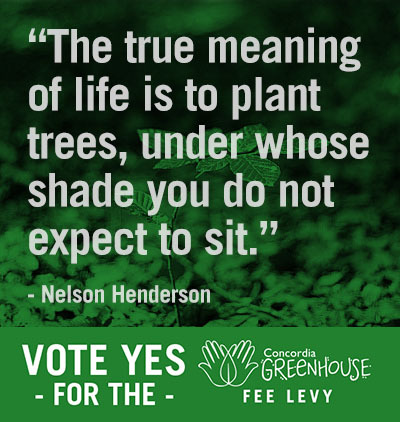 Most importantly, if you are an undergraduate student at Concordia university, REMEMBER TO VOTE YES for sustainable projects on campus, like the GREENHOUSE! March 26, 27, 28th – set reminders on your cell phones and vote in the 2013 Referendum to SAVE THE GREENHOUSE! Coming up this week at the Greenhouse! WE NEED YOUR HELP! Ever wanted to volunteer for the greenhouse? Now is this time! Come by one of our volunteer training session MONDAY the 18th at 4:30. Even if you can`t make that time, please stop by this week and speak with our collective members about fun and interesting ways you can help out! Learn how to start your own seeds this spring! It`s so easy with the right information. Free. In the greenhouse we grow our own local edibles! Come to these unique micro-greens info session where you can see how a greenhouse works, learn about best practices for home grown sprouts, PLUS those interested in volunteering will have the opportunity for hands-on practice! Ever wanted to know about what projects we`re working on in the greenhouse? Come check out our Microgreens operations, Aquaponics room, Tea Atrium, Green lending libary and so much more! This workshop will explore patching techniques as a way to individualise, reclaim and reduce the environmental impact of fashion and fibres. EQUINOX Concert Fundraiser! Thursday, March 21st from 7-11pm What better way to celebrate the glory and uniqueness of the Concordia Greenhouse than by lighting candles and listening to music under the evening sky, surrounded by plants and good people? This semester the atrium team is throwing a pay-what-you-can, no-one turned away concert to raise a few bucks for the tea atrium space and its garden. We’d love to see you for merriment Thursday, March 21st from 7-11pm, with a wonderful line-up of musicians that will be playing from 8-10pm. Check out the descriptions of our guests, and hope to see you there. It`s almost time to get your summer seedlings. Stay tuned for an amazing heirloom plant list which will be posted on our blog next week! Our beautiful social space, The Tea Atrium, is a soothing oasis of fresh air, green plants of all sorts, as well as lots of locally grown edibles. Learn about our variety of demonstration beds, housing everything from tea to cacti to strawberries! Participants will have the option to help out with our weekly tasks to learn more about how our space functions. Plus, grab a free cup of tea grown right in the atrium!